Mar chuid lárnach den churaclaim, bíonn na páistí páirteach in réimse leathan d'imeachtaí spóirt agus fisiceacha. Idir gleacaíocht, damhsa agus lúthchleasaíocht. Faigheann na páistí ceachtanna den chaighdeán is airde ó oiliúnóirí cáilithe snámha sa tsólann áitiúil, coitseálaithe CLG ó chomhairle Uladh agus múinteoirí atá lán-cháilithe in imeachtaí éagsúla idir lúthchleasaíocht agus na cluichí Gaelacha ar fad. As part of the curriculum the children take part in various activities – gymnastics, athletics, games and dance. Children in key stage 2 participate in swimming activities, which take place in the local leisure centre and are carried out by a qualified instructor. 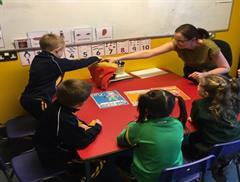 Ulster Council also provide a coach who teaches the basics of fundamental movement in key stage 1. We offer Hurling, Camogie, and Gaelic football (for both girls and boys). 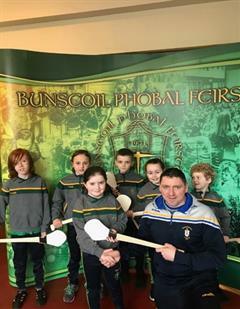 We participate in all competitions organised by Cumann na mBunscol. These include: 5-aside tournaments, INTO minis 7s, championships and league competitions. 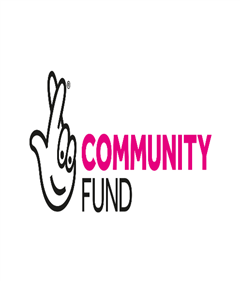 We also take part in competitions organised by local secondary schools and primary schools. 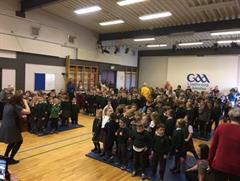 Féile Peile na Gaelscoileanna is a very important competition that we take part in. We have had a lot of success over the last few years winning competitions such as, Camogie 5 aside, INTO boys’ football 7s, Girls football league, Camogie championship, INTO Camogie 7s, Féile Peile na Gaelscoileanna and the St Genevieve’s football tournament. 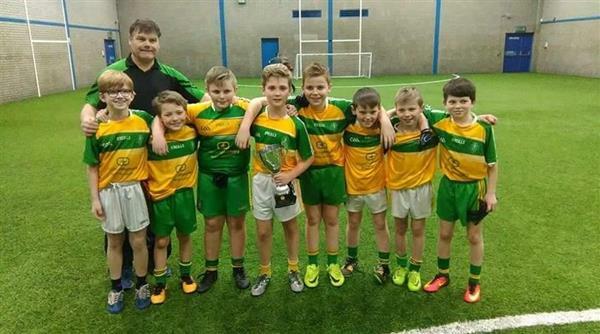 For many years now some of our children have been selected to play on the Belfast team and have played games in places such as, Croke Park, Parnell Park and Casement Park. Apart from promoting and developing our cultural sport we also provide the children with opportunities to experience other types of games. A qualified and professional basket ball coach teaches basket ball to the children and in recent years we have taken part in tournaments provided by St Mary’s Grammar school. Sport is an opportunity for children to develop both physically and in confidence, therefore we provide SPORTS FOR ALL. This allows children to experience various types of games in a non-competitive environment.